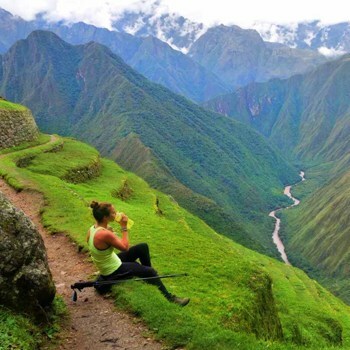 Peru benefits from being a country that has a lot of beach space, with the whole of its west coast bordering the Pacific Ocean – the largest body of water on Earth. The Peruvian coastline runs down from the Ecuadorian border in the north, to the Chilean border in the south. There is a tropical dry climate on the northern shores, and a subtropical desert climate with little rainfall on the central and southern coast. The waters are influenced by two important currents, one called El Niño (a warm current) and the other called the Humboldt (a cold current). Together, these currents are responsible for the variety of wildlife found in Peru, as well as the climate, and of course the Ocean’s temperature. 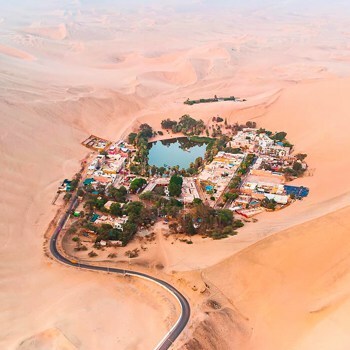 A dramatic contrast with the vast Ocean is Peru’s dry, desert coastline, and many cities are located along this desert strip – in fact, over 50% of the population live by the Ocean. Here in Peru, the Pacific plays a big role in life, from the famous seafood dishes to the popular surf culture. With so many beaches to pick from – over 1,400 miles worth – the choice is yours, whether it be turquoise waters and soft sands, or vertical cliffs and dramatic waves. We have gone for a diverse group of 5, each very different to the next one. 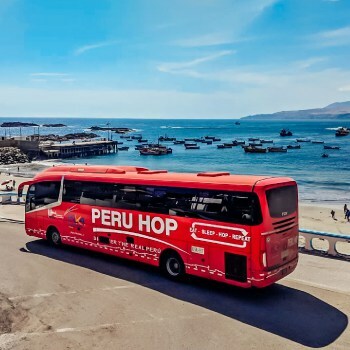 HOW TO PERU QUICK TIP: The best way to get to Peru’s best beaches while seeing some of the country’s hidden gems is by traveling with Peru Hop. 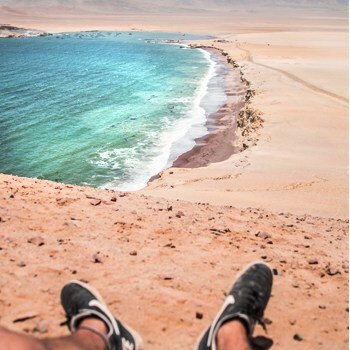 Just 4 hours south of Lima, and found tucked away in the Paracas National Reserve, this peaceful beach has stunning scenery and is great for witnessing wildlife in their natural habitat such as: many species of birds and fish, sealions and depending on your luck dolphins and/or whales! Given the name due to the red sand formed by the igneous rock known as pink granodiorite, which contains solidified magma inside, the Red Beach holds the views to landscapes dramatic enough to feature in a movie. Although protected, meaning you can’t take a dip in the water, the beach has beautiful, cool blue waters and set in an endless desert making it a perfect day getaway. The best way to go to the Red Beach is usually through a 1, 2 or 3 day round trip from Lima. 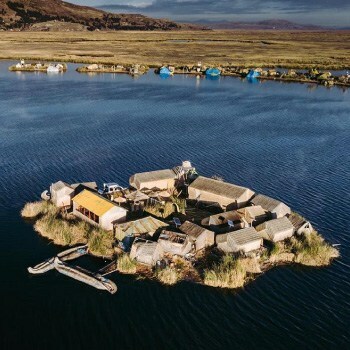 In the tour, the guide will tell you about the history and culture of Paracas as well as visit the Ballestas Islands, Peru’s “mini Galapagos”. The City Beach – Miraflores, Lima. Whilst it may not be the most beautiful, this beach with a city backdrop makes for a cosmopolitan feel. If you head down to the shore by Miraflores – known as the ‘Costa Verde’ and one of the best neighbourhoods in Lima – you’ll pass some nice apartment blocks with exclusive sea-views, lush green vegetation, as well as looming brown cliffs. With the paragliders floating up above you like giant, colourful birds, there’s something surreal and dreamlike about this beach. Here at the sea-front you’ll find the opportunity to take a surfing lesson – in fact, this beach is more popular for surfers than swimmers. Other activities you can do include running, cycling, and rollerblading if you’re feeling active! Visit this beach for an easy escape, away from the city noise, but close enough to wander back into town for dinner! To maximise your time at the beach, we suggest Lima Bici which offers a full day bike tour along the beach and a surf class every day of the year. There’s a fancy restaurant close by with a nice board walk called La Rosa Náutica, and you’ll find many more places to eat if you head down the coastal road towards Barranco and Chorrillos. Just a stone’s throw away from the beach you can find Larcomar, a very nice shopping centre with some great places to get food and drinks, such as Mangos (head here in the afternoon to watch the sunset over the Ocean!). 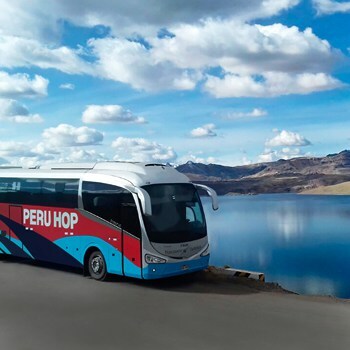 HOW TO PERU TRAVELING TIP: Peru Hop is the easiest and most direct way to get to Paracas, a beautiful seaside town located near some of the country’s best beaches. Want a romantic get-away, or just a peaceful retreat in paradise? Look no further than Punta Sal. 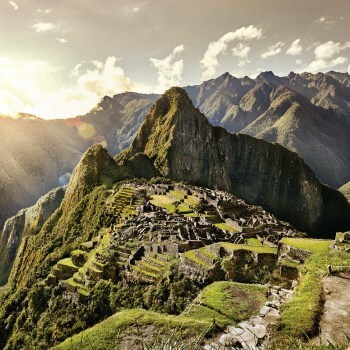 Situated in the north of Peru, here you’ll find long, sandy beaches, lush palms, and beautiful sunsets. Discover tranquility in a luxurious spa hotel, appreciate the amazing seafood, try fishing or diving, and if you visit between June and October you can even go whale watching. A dreamy place with white sands, blue skies, and calm, warm waters all year round (24 degrees Celsius), there are even accommodation options to match the beauty of this beach. Stay in a beach-front bungalow or villa, or an all-inclusive resort, and let all your worries wash away. Head north to beat the fog that hangs over the central and southern coast, and enjoy the sun whatever the season. Here in Mancora there are many nightclubs, open-air bars and restaurants, and over 30 resorts, making this a popular destination for people from all over South America. Here you’ll find a party pretty much every night of the week! The most popular party season is from December to March. If you’re looking for some downtime the morning-after, this is the perfect place. Aside from partying, the other main activity here is relaxing on the beach. Take a refreshing dip in the water or simply lie in the sun. 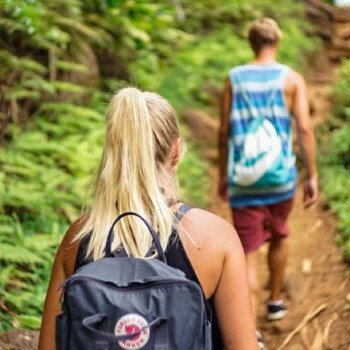 If you’re after something more lively, here you’ll also find plenty of activities to do including windsurfing, kayaking, horse-riding, and of course, surfing. 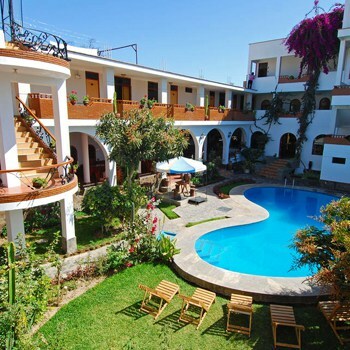 With its laid-back, hippie vibe, many travellers end up staying here longer than planned. Officially an International Surfing Reserve – one of just five worldwide – this is the place to go with your surfboard and hit the waves (which are, in surfers’ terms “consistent”, and best between April and October). If you’ve never tried this sport before don’t worry, you can find many places offering lessons. The summer season (from December to March) is the most popular time to visit, although surfing can be done at any time of year with a wetsuit if you’re cold. Here it’s not only the surfing that is famous, the seafood is too. Huanchaco is a fishing town, so if you don’t fancy hitting the waves with your surfboard, another option would be to try your hand at fishing. The perfect way to finish off your trip here would be hitting up a local seafood restaurant for ceviche, accompanied by a refreshing beer.